Many people think Benjamin Franklin discovered electricity with his famous kite-flying experiments in 1752. 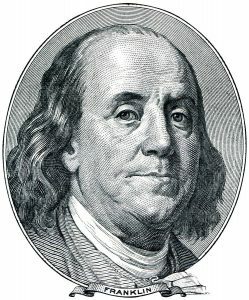 Franklin is famous for tying a key to a kite string during a thunderstorm, proving that static electricity and lighting were indeed, the same thing. However, that isn’t the whole story of electricity. Electricity was not “discovered” all at once. At first, electricity was associated with light. People wanted a cheap and safe way to light their homes, and scientists thought electricity might be a way. Learning how to produce and use electricity was not easy. For a long time there was no dependable source of electricity for experiments. Finally, in 1800, Alessandro Volta, an Italian scientist, made a great discovery. He soaked paper in salt water, placed zinc and copper on opposite sides of the paper, and watched the chemical reaction produce an electric current. Volta had created the first electric cell. By connecting many of these cells together, Volta was able to “string a current” and create a battery. It is in honour of Volta that we rate batteries in Volts. Finally, a safe and dependable source of electricity was available, making it easy for scientists to study electricity. An English scientist, Michael Faraday, was the first one to realize that an electric current could be produced by passing a magnet through a copper wire. It was an amazing discovery. Almost all the electricity we use today is made with magnets and coils of copper wire in giant power plants. Both the electric generator and electric motor are based on this principle. A generator converts motion energy into electricity. A motor converts electrical energy into motion energy. In 1879, Thomas Edison focused on inventing a practical light bulb, one that would last a long time before burning out. The problem was finding a strong material for the filament, the small wire inside the bulb that conducts electricity. 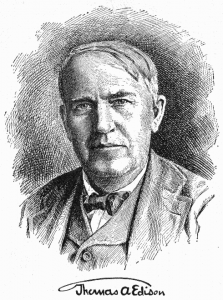 Finally, Edison used ordinary cotton thread that had been soaked in carbon. This filament didn’t burn at all—it became incandescent; that is, it glowed. The next challenge was developing an electrical system that could provide people with a practical source of energy to power these new lights. Edison wanted a way to make electricity both practical and inexpensive. He designed and built the first electric power plant that was able to produce electricity and carry it to people’s homes. Edison’s Pearl Street Power Station started up its generator on September 4, 1882, in New York City. About 85 customers in lower Manhattan received enough power to light 5,000 lamps. His customers paid a lot for their electricity, though. In today’s dollars, the electricity cost $5.00 per kilowatt-hour! Today, electricity costs about 12.7 cents per kilowatt-hour for residential customers, about 11 cents for commercial, and about 7 cents per kilowatt-hour for industry. The Question: AC or DC? The turning point of the electric age came a few years later with the development of AC (alternating current) power systems. Croatian scientist, Nikola Tesla came to the United States to work with Thomas Edison. After a falling out, Tesla discovered the rotating magnetic field and created the alternating current electrical system that is used very widely today. Tesla teamed up with engineer and business man George Westinghouse to patent the AC system and provide the nation with power that could travel long distances – a direct competition with Thomas Edison’s DC system. Tesla later went on to form the Tesla Electric Company, invent the Tesla Coil, which is still used in science labs and in radio technology today, and design the system used to generate electricity at Niagara Falls. Now using AC, power plants could transport electricity much farther than before. While Edison’s DC (direct current) plant could only transport electricity within one square mile of his Pearl Street Power Station, the Niagara Falls plant was able to transport electricity over 200 miles! Electricity didn’t have an easy beginning. While many people were thrilled with all the new inventions, some people were afraid of electricity and wary of bringing it into their homes. They were afraid to let their children near this strange new power source. Many social critics of the day saw electricity as an end to a simpler, less hectic way of life. Poets commented that electric lights were less romantic than gaslights. Perhaps they were right, but the new electric age could not be dimmed. In 1920, about two percent of U.S. energy was used to make electricity. In 2015, with the increasing use of technologies powered by electricity, it was almost 40 percent.